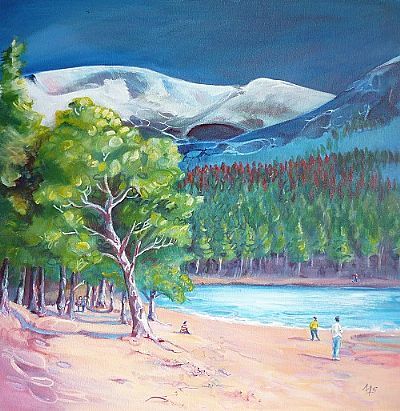 This is my latest acrylic painting entitled 'Snow on the Mountains, Sun on the Beach'. 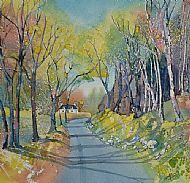 As April is Bowel Cancer Awareness Month and this painting was painted in response to my diagnosis of Bowel Cancer in Jan this year, it was the obvious choice for Painting of the Month. The dark, brooding sky, cold mountain tops and dense forest represent my feelings especially regarding chemo. It is not all doom and gloom however, hence the sunny beach. The fact is, that if caught early enough, bowel cancer is very treatable. Don't let embarrassment stop you, if you have symptoms go see your Doc and if you have received that 'little test' in the post, do it, it may just save your life. AND come on England, Ireland & Wales, people need these tests at 50, 60 is way too late! from a variety of local artists. 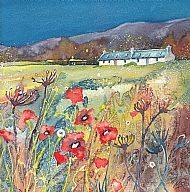 giclee prints and cards available.